Thanks for all your hard work so far. We’ve established that Mr Ordie has a macrocytic anaemia with normal thyroid function tests, normal B12 and folate and no significant alcohol history. He takes methotrexate and folic acid for rheumatoid arthritis. Methotrexate can cause a mild macrocytosis, or in overdose (intentional, due to drug interaction, or due to acute renal failure and accumulation) can cause a significant pancytopenia. Which tests might be done in the haematology clinic? How do they help to confirm the diagnosis? Please respond on twitter using #unofficialCSIM2. Please join in the case and learn as you go! More updates later this week. 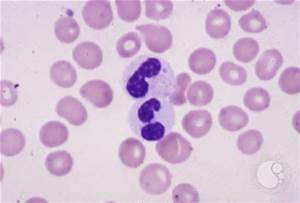 This entry was posted in Acute leukaemia, Anaemia, Bone marrow failure and tagged anaemia, Blood film, Macrocytosis. Bookmark the permalink. Thanks for all of your useful comments. We try to do most of the discussion via Twitter – next time reply to us and use #teamhaem! Thanks!